The Circuit Check kit called the Chameleon allows easy re-use of a majority of an ICT fixture’s major components. 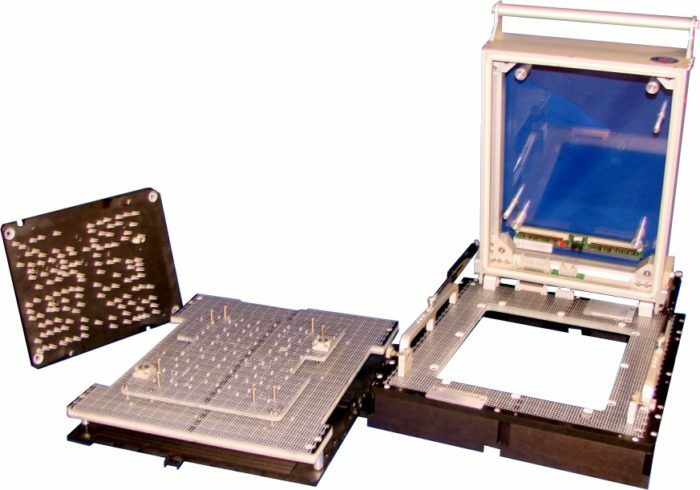 The Chameleon includes a full size probe plate and interface alignment plate so all valuable tester resources are available. The probe plate assembly is held in place with twelve (12) screws and the vacuum box’s interchangeable push plate is easily replaced by removing four (4) shoulder screws. The Circuit Check ReNu core consists of the replaceable patented “Quick Check” interface alignment plate, probe plate and Quick Plate, in addition to the interchangable push plate. Note: If installed within an Keysight/Agilent test system, the VTEP mux card is placed within the fixture so it resides as a part of the fixture. The VTEP mux card does not need to be replaced when a ReNu core is interchanged.